First In A Series Of Interviews With South County Candidates: Laguna Hills City Council Candidates Dr. Raghu Mathur, Bill Hunt, Andrew Blount, And Dore Gilbert, M.D. I never like to let a chance to blog go to waste, particularly in an election year, so I thought I would focus my efforts on where I live – South County. My goal is to interview candidates for most, or all, South County City Council races and post a blog about each interview. Since I’m not crazy, and I have a day job, I will be asking each candidate the same few questions that I think will give the voters a quick look at the candidates and their qualifications. Also, since I am on the Republican Central Committee, and there are far too many candidates for each position to interview all of them, I am limiting my interviews only to those who sought the endorsement of the OCGOP (whether or not they actually received the endorsement). Without further ado, we start with a city that I have a hard time finding until I’m within the city limits, and even then, I’m not sure – Laguna Hills. As OC Political noted earlier, the race for two open seats (very rare around here) is hot and heavy between four legitimate candidates: Dr. Raghu Mathur, Bill Hunt, Andrew Blount, and Dore Gilbert, M.D. Raghu is running for City Council to ensure fiscal responsibility, be a strong advocate for businesses, and bring transparency, accountability, and ethics to council decisions. Raghu says that fiscal responsibility is essential in this economy, with a $16 trillion national debt and a broke California, that leaves only the local level. He wants to prioritize all goals and expenditures and consider public sentiment and input in determining which projects are most important for residents. He said the city needs to address compensation, particularly city management. Raghu gave the example of the City Manager whose compensation is over $460,000 per year, including a car for personal and family use. He wants to move the city to a 401k-style pension with the employees contributing their portion (the city currently contributes both its and the employees’ portion for retirement). Raghu stressed his experience as President of Irvine Valley College where he says he turned a $500,000 deficit into a $500,000 surplus in one year, as well as his time as Chancellor of the South Orange County Community College District where he managed a budget of approximately $500 million. Raghu also said that he taught university courses in budget management. Although he wants to address compensation issues, Raghu want to assure the employees that transparent negotiations are not meant to pressure or threaten them. He wants the good work of management and staff to be recognized and rewarded. Raghu also wants to be the strongest advocate for businesses. He believes in the free enterprise system and would like to have a business-friendly council. He strongly supports maximum freedom for businesses and minimal regulations. Raghu wants to develop a business recruitment and economic development plan and create a business and economic development commission comprised of businesses, residents, and a local Chamber of Commerce (since Laguna Hills currently has no Chamber, he wants to create one). Raghu also wants to hear from local businesses how the council can support them and bring additional businesses to the city. He believes that successful businesses mean more taxes resulting in funding for necessary public services. Raghu is opposed to any increase in taxes or fees. He wants to create more local jobs and internships for local students. Raghu wants to make the council transparent, accountable, and ethical. He stated that there is a public employee union being formed in the city which means future contract negotiations. He wants all negotiations regarding compensation to be conducted in an open setting, sunshined through the public agenda along with the fiscal implications of the proposal. Raghu wants the same sunshine process for any counter-proposal from the union. He would consider bringing in an outside negotiator or auditor so there is no potential conflict of interest with management. Raghu believes the city must operate in an open fashion to earn the trust and respect of the residents. On accountability, Raghu wants the city to disclose its goals for management and the council and provide progress reports and final reports on whether the goals were met. On ethics, he said he will make all of his council decisions ethically, with no favoritism. Raghu believes it is a tough line to walk between protecting the quality of life for existing residents and businesses, but acknowledging the need for additional development in the future. He will focus on what the residents and existing businesses have to say. Raghu uses his scientific background to collect data, ask probing questions, and he feels that he can find win-win solutions in that manner. Raghu is endorsed by, among others, the Orange County Register, the California Republican Assembly, Orange County District Attorney Tony Rackauckus, Tom Fuentes (before he recently passed), and Laguna Hills council member Barbara Kogerman. You can find out more about Raghu at http://www.mathurforlagunahills.com/. Bill noted that, for the first time in the city’s history, there are two openings on the council, and he wants to use his two decades of experience with the Orange County Sheriff’s Department to continue the conservative policies the City Council has put in place, and give back to Laguna Hills, where he raised his family and served for four years on the Parks and Recreation Commission. Bill stresses fiscal responsiblity and wants to spend the city’s tax dollars wisely. He said the city has done a good job fiscally – the city is in the black, it supports businesses, and it has a 2% at 60 retirement formula for its employees. Bill wants to continue that process. Bill is pro business. He wants the city to do everything it can to accommodate the business community. He does not want to subsidize businesses, but support them to ensure more tax dollars for the community. Bill’s 20+ years with the Sheriff’s Department has led him to the conclusion that public safety is vital to the city. He believes that local government’s primary responsibilities are to provide safety and good infrastructure for its residents. Bill said that the current council has done the basics well, and he wants to continue that process. Bill believes that, overall, compensation for city staff is fair. He said the proof is in the pudding – Laguna Hills is not facing the unfunded liabilities for employee benefits that other Orange County cities face. He believes that the City Manager’s compensation is more of a political issue than a fiscal one. Bill wants there to be an open discussion on the City Manager’s salary with input from the public. He said that there is not a lot of staff or a large bureaucracy in the city and many staff members are doing multiple jobs. He feels that the staff is doing a good job managing the city. However, he said he will propose a 401k-style pension system for future city employees, which he believes will protect against future unfunded liabilities. Bill said that Laguna Hills is fairly built out and there is not a lot of growth potential, so he would focus on maintaining the existing quality of life for the current residents. He wants to work with businesses to create a profitable business environment to make Laguna Hills a place people want to come and shop. He emphasized the importance of public safety on quality of life. Bill is endorsed by, among others, Congressman John Campbell, Laguna Hills Mayor Melody Carruth, Laguna Hills council member Joel Lautenschleger, the California Republican Assembly, and State Senator Mimi Walters. You can find out more about Bill at http://billhunt.org/. Andrew believes we live in a country where everyone has the right to life, liberty, and the pursuit of happiness, and he is running for Laguna Hills City Council because he wants to help the people of the city achieve those rights on a local level; he’s met many of the city’s residents in his involvement in the community and he wants to represent them on the council. Andrew believes that employee compensation is too high, and he will rectify it. The top three management positions were paid more than $1 million combined last year. He said that the City Manager made over $400,000 last year, including $30,000 toward his pension alone. The city also paid $60,000 for a car for the City Manager that could be used for his personal and family use. Andrew also said that the city pays for both the employer’s and employee’s share of retirement payments for all management staff. He noted that the city’s annual budget is approximately $30 million per year, which equates to approximately $1,000 per resident and he does not believe that the residents are getting their bang for their buck. He questioned why the city pays the City Manager $400,000 while it does not provide the basic services that surrounding cities do, and that the residents deserve. Andrew wants to focus on after school programs, senior services, and emergency response services, not expensive compensation packages for management. Andrew also believes the water rates the residents currently pay are too high. He said that the tiered system currently in place is not working and is too costly, including 700% penalties for some residents. He thinks that the city can control the water rates, with the consensus of the residents. He will work with the residents to build that consensus, and then take the fight to the Water Board on their behalf. Andrew also wants to create a better business environment within the city. He noted that neighboring cities are actively recruiting businesses, and he does not want to lose existing businesses, or the chance to bring in new businesses. Andrew said that businesses bring in sales and property tax revenues that are vital to providing necessary public services. He believes that the current council thinks businesses should consider it a privilege to be in Laguna Hills, while Andrew believes it is a privilege to have the businesses as a part of the city. Andrew sees the city’s revenues decreasing and he wants jobs to stay local. He also thinks that businesses provide great places in the city for the residents to shop and eat. Andrew believes the current council has too tight a regulatory burden on businesses. Although the city does not have a business license fee, Andrew said it charges several other burdensome fees. He also noted that there is no standard process available to prospective businesses that will give them an idea of the fees and costs they will incur before they start their project. He gave the example of H2O Partners – a business that came to the council with an idea for a water park. The council rejected their project. Fortunately, as many good businesses do, they came back with a different project (trampoline entertainment center) that ultimately was approved. However, Andrew does not believe the city should hope that rejected businesses come back, but that the city will welcome them with open arms in the first instance. Andrew will standardize the permitting process so that businesses will know at the beginning of their project what fees and costs they will face. Andrew wants businesses to succeed and he will work to provide a successful business environment if elected to the council. Andrew noted that Laguna Hills is mostly built out. He said there is a mixed-use project, Oakbrook Village, near the Laguna Hills mall, that he believes will bring younger, more upwardly mobile residents to a city that has shrunk in population over the past 10 years. He wants to analyze projects on a project-by-project basis to determine if it will benefit the city and protect the existing residents. He wants to ensure that the same high quality of life that Laguna Hills residents currently enjoy is enjoyed by the residents in the future as well. Andrew is endorsed by, among others, the Orange County Register, Laguna Hills council member Barbara Kogerman, Orange County District Attorney Tony Rackauckus, the Lincoln Club, and Laguna Hills Watch Dog – Jean Bland. You can find out more about Andrew at http://www.blountforlagunahills.com/. Dore is running for City Council because he thinks he can make a difference for the residents of Laguna Hills by restoring civility and intellectual discussion at City Council meetings. Dore wants to maintain fiscal responsibility in the city. He wants a strong reserve, employee compensation comparable to similar-sized Orange County cities, and a transparent council that allows the residents to have faith in the decision-making process. Dore also stresses public safety. He wants to continue to support the number of Sheriff’s deputies in the city that are necessary for the residents’ safety and to keep the crime rate low. Dore’s interest in public safety extends to the national level as he enlisted in the Army Reserves at age 60 and his youngest son is a Corporal in the Marine Corps. Dore believes the city needs to maintain a business-friendly environment that welcomes businesses which he says will produce jobs and revenue for the city. He said he will continue to streamline the business permitting process and will not burden businesses with taxes and fees. Dore is opposed to any new taxes or fees. Dore stated that employee compensation is greater than the norm of similar-sized cities in Orange County. He said that some compensation issues have been taken care of by the council (for example, the car allowance is gone), but he wants the council to take a look at compensation and, when it is not in conformity with other similar-sized cities, negotiate changes to conform with those compensation packages. Dore said that Laguna Hills is nearly built out and there is not a lot of open land. He noted the Oakbrook Village project near the Laguna Hills mall that is slated for re-development, but Dore wants to focus on how the council can maintain a beautiful city. He wants to update traffic plans, maintain the parks for people of all ages, and properly maintain the streets. Dore wants to maintain the quality of life that he and his family have enjoyed in their 31 years in Laguna Hills. He and his wife of 36 years have raised 5 children in the city. Dore served on the Saddleback Valley Unified School District board for 29 years. He is very involved in his community – coaching football and baseball and serving on the Community Center Planning Commission. Dore is endorsed by, among others, State Senator Mimi Walters, Orange County Supervisors Pat Bates and Janet Nguyen, State Assemblyman Don Wagner, and Orange County District Attorney Tony Rackauckus. You can find out more about Dore at http://www.doregilbert2012.com/index.html. With the retirements of Councilmen Joel Lautenschleger and Allan Songstad, for the first time in the history of Laguna Hills, the majority of the City Council will not be members of the inaugural City Council that took office in 1991. Five candidates have filed to replace Lautenschleger and Songstad, and all but one is a major contender. We can quickly rule out AJ Djowharzadeh (R), who won 6% of the vote in his 2010 bid for Laguna Hills City Council. 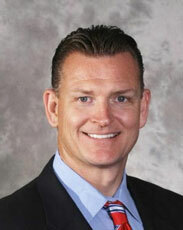 Blount is a businessman who’s launched real estate, financial analysis, and software companies. Blount’s gathered the endorsements of various elected officials, including District Attorney Tony Rackauckas, Assemblyman Jim Silva, and various City Councilmembers from across Orange County. Gilbert is a former Trustee on the Saddleback Valley Unified School District, serving from 1981-2010. He is a doctor who joined the Army at the age of 60 and is currently a Lieutenant Colonel in the United States Army Reserve. Hunt is the former Orange County Sheriff’s Lieutenant who unsuccessfully challenged incumbent Sheriff Mike Carona in the 2006 election. As an OCSD Lieutenant, he served as the de facto Chief of Police for San Clemente. Carona demoted him after the election, and Hunt elected to leave the department instead. 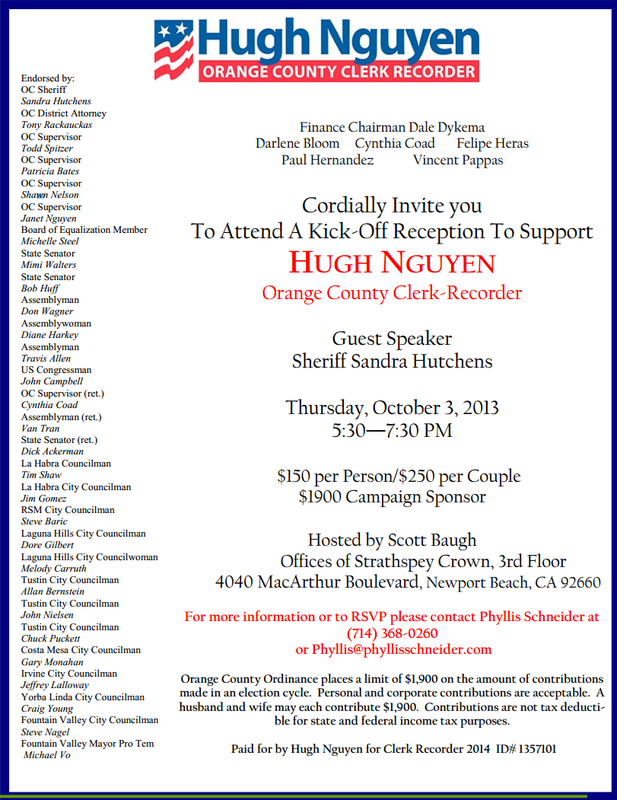 After Carona resigned in 2008 in the face of a 66-count federal corruption indictment, Hunt sought the appointment to be Orange County Sheriff, but the Board of Supervisors appointed Sandra Hutchens instead. Hunt unsuccessfully challenged Hutchens in the 2010 election. He now owns a private investigation business in Laguna Hills. Hunt’s gathered the endorsements of various elected officials, including Senator Mimi Walters, Assemblyman Don Wagner, the majority of the Laguna Hills City Council, and various City Councilmembers from South Orange County. Mathur is the former Chancellor of the South Orange County Community District, the former President of Irvine Valley College, and a former Trustee on the Saddleback Valley Unified School District, serving from 1983-1992. Mathur has gathered the endorsements of various elected officials, including District Attorney Tony Rackauckas, Orange County Board of Education President Dr. Ken Williams, and several City Councilmembers from across Orange County.